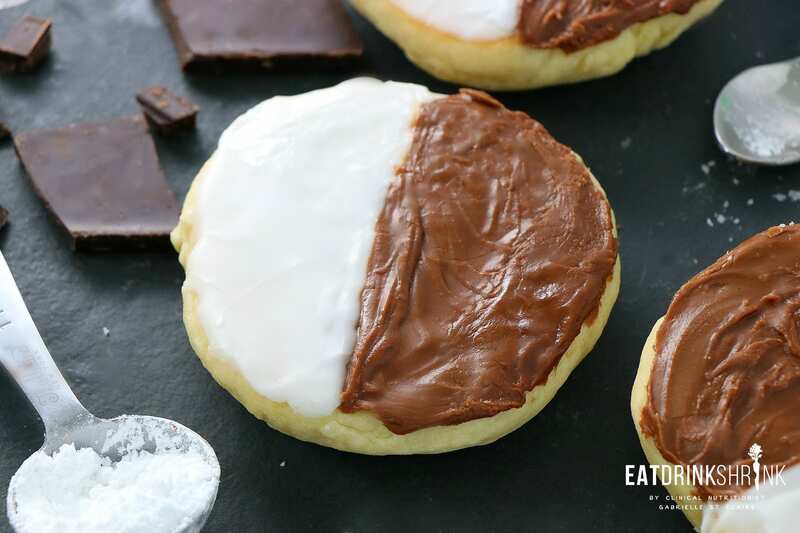 Vegan Black and White cookies - Eat. Drink. Shrink. There are some concepts that just become engrained in your memory. 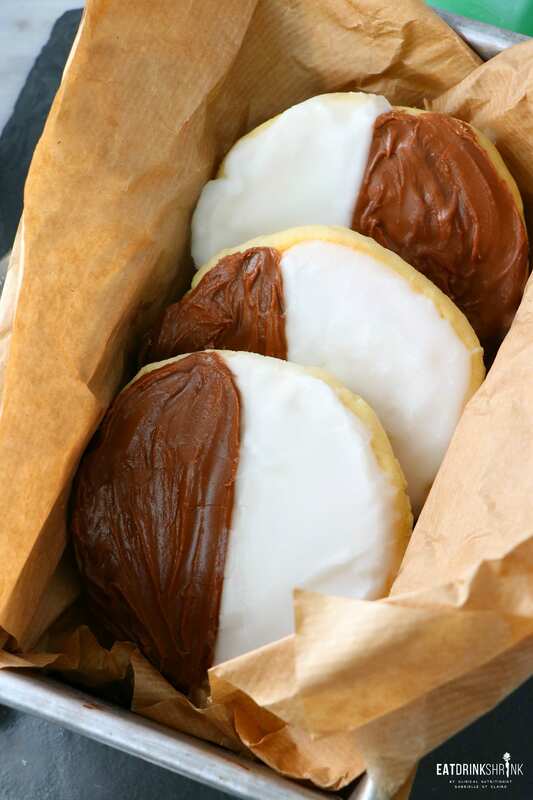 While black and white cookies weren’t ever a “thing” down south and more concentrated up north where they were created, everything about this cookie was just so unique to me. 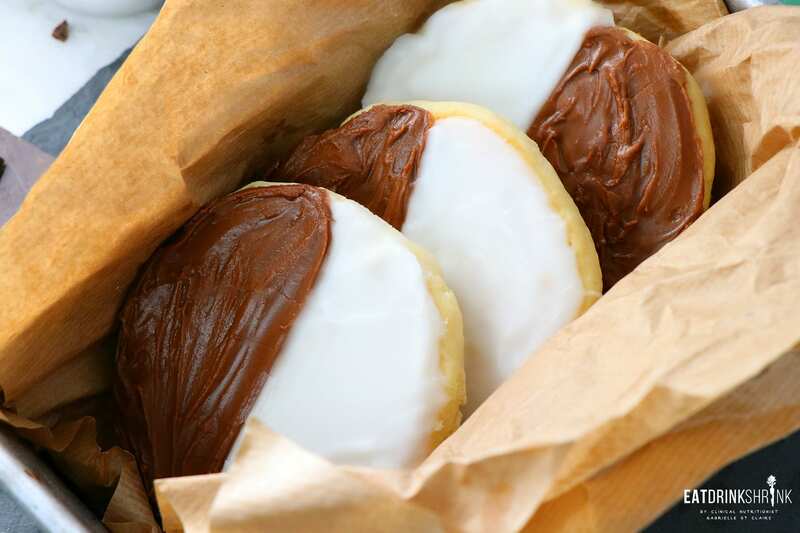 Originally this cookie had a chocolate based, then evolved to be vanilla, and then the textures became diverse. Typically they had the traditional crisp cookie texture, but were also seen more with a light and fluffy texture, which is more my preference. I personally gravitate towards soft cookies, so as you would imagine, it was love at first sight lol. Sadly, like most classic concepts, there are no vegan alternatives. 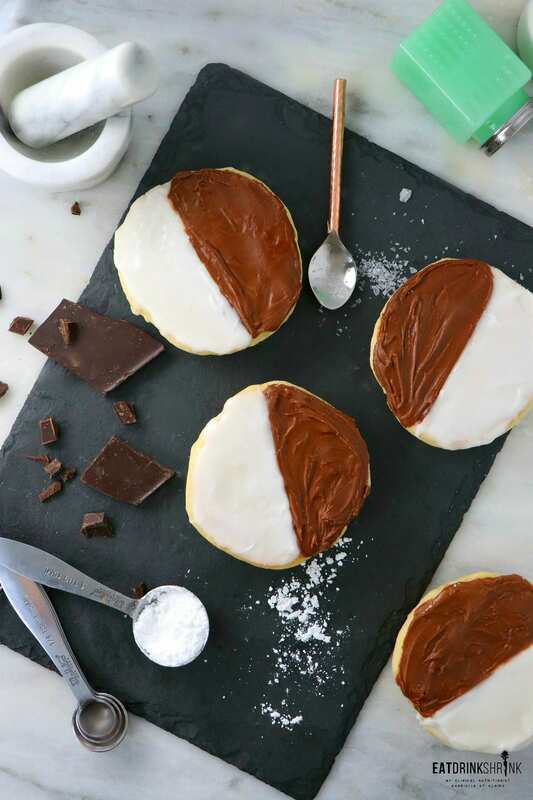 That being said, I was on a mission to create an effortless vegan black and white cookie recipe!. What I love about this cookie, is everything! It’s my classic easy soft bake cookie recipe, affordable, features a handful accessible and affordable ingredients, one bowl, texture is buttery soft, perf for any season, you can switch up the size, and non vegan approved! 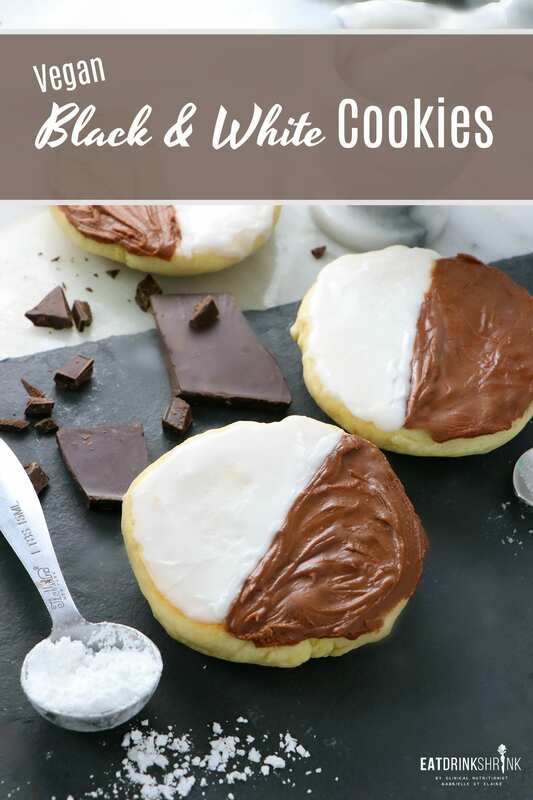 If you love nostalgic vegan concepts, you have to try my recipe for vegan Black and White Cookies!! In medium bowl, sift together flour, baking powder and salt. Set aside. In the bowl of a standing mixer, beat together powdered sugar, melted coconut oil, room temperature almond milk and vanilla until creamy. Add flour mixture and continue to mix until combined. Dough will thicken as you stir. Roll 4tablespoon size scoops of dough into balls and place onto prepared baking sheet. Flatten slightly with fingers to 1/2-inch thick. Bake cookies for 8-10 minutes. Do not over bake, as cookies won't turn golden brown. Remove cookies from oven and place on cooling rack to cool completely. When cookies have completely cooled, prepare the frosting. In a large mixing bowl, combine the confectioners’ sugar, boiling water, and vanilla. Mix well to get a spreadable icing. Add a little more water, if needed. 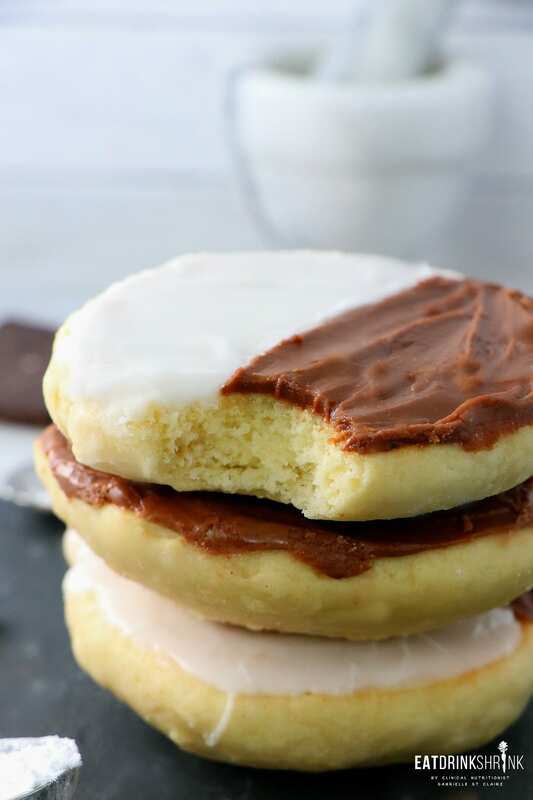 Using an offset spatula, spread a thin layer of icing onto the FLAT SIDE, the former bottom, of each cookie. Return the cookies to the wire rack to dry. You should have about ½ cup of icing left.